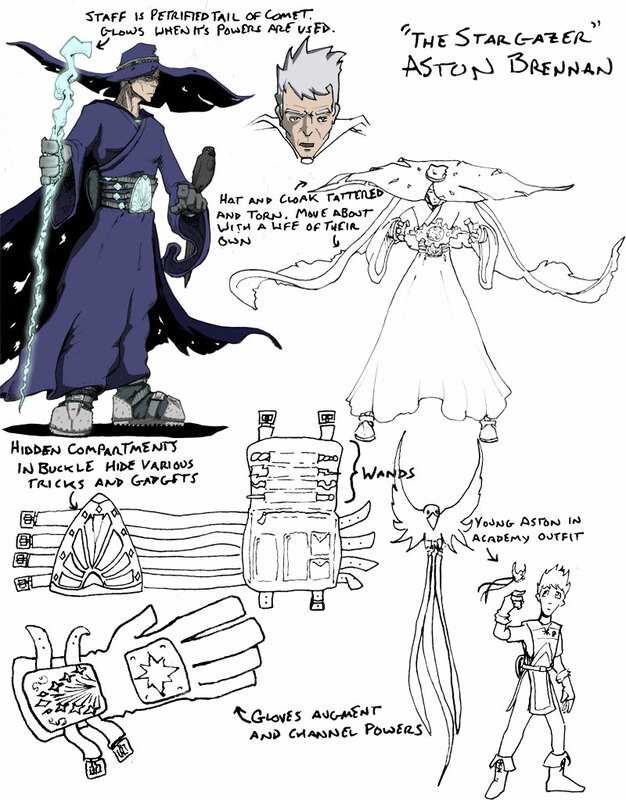 Aston Brennan is an Astral Savant, a powerful mage in service to one of the powerful beings who bind themselves to the stars in the skies. Or he was an Astral Savant, rather, before he retired. Weathered by his decades of adventure, but unwilling to retire into total passivity, Aston decided to open a magic shop and wizard for hire business in the one town where there's really a market for it: Void City. Aston is a staunch optimist in most situations, borne not only by his continued success, but his general refusal to give up in any circumstance. He is clever, though, and years of experience have made him a wily old coot. Aston is well educated, and takes pains to always appear so when the opportunity strikes. This tends to get a little annoying. Aston has several sources of power accumulated over the years. Some of these powers are innate and as expansive as his creativity in scope. Others are learned and are more rigid in form and function, but still very flexible. Still others are granted powers, which tend to be pretty specific in their use. -Always knows time and direction, even when stars are not visible. -Can name any star in the sky just by looking at it, and is able to know the general aspects and purpose of each star. -Can generate light of nearly any magnitude in shafts or as a general wash. This includes light that is soft as a candle or intense enough to burn, though such effort is taxing after repeated use. These are Aston's spells. Learned spells were never his strong suit, so he has a wide selection of relatively simple effects that either manipulate the battlefield around him in some way (walls of earth or fire), manipulate small objects remotely, any any number of minor, usually non-leathal "special effects." Aston commands the Favor of the Stars. During his adventures he has befriended many of the Astral Denizens, and many of them have granted him their perpetual favor. The ability to call upon the secret power of the stars by speaking the star's Secret Name. Each star has it's own signature power which Aston can direct to a limited extent. His cloak also grants him the ability to teleport through shadowed areas. His gloves allow him to focus and fire his starlight blasts more often. His staff augments all of his magical abilities, and glows brightly when used. He carries a small number of alchemical tricks, magical devices, and magical items to achieve a sort of "bag of tricks" for miscellaneous situations.